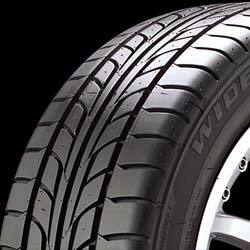 The Firehawk Wide Oval w/UNI-T is Firestone's Ultra High Performance Summer tire for today's driving enthusiasts in much the same way the original Wide Oval, the industry's first low profile, bias-ply performance tire, helped revolutionize high performance passenger tires in the late 1960s. Today's Firehawk Wide Oval radial tires were developed for high performancesports cars, coupes & sedans, & are designed to provide world-class handling, performance & durability on wet & dry roads. The Firehawk Wide Oval is not intended to be driven in snow. Firestone's Ultimate Network of Intelligent Tire Technology (UNI-T) features three core elements: CO'CS, a Computer Optimized Component System which allows design & manufacturing processes to work more cooperatively, leading to a more efficient tire that doesn't significantly sacrifice one area of performance for improvements in another; O-Bead, a more round structure that minimizes overlapped joints in the bead area for improved ride;& L.L. Carbon (Long Link Carbon) which helps the rubber compound resist microscopic tread tearing related to wear. On the outside, the Firehawk Wide Oval features high performance silica-enhanced L.L. Carbon tread rubber compound molded into an independent-block, directional tread design to blend responsive handling along with wet & dry traction, while circumferential & lateral grooves team up to provide hydroplaning resistance. On the inside, the Firehawk Wide Oval features twin steel belts reinforced with spirally wrapped nylon ply to provide strength, stability & high-speed capability. Firestone Firehawk Wide Oval tires feature black sidewall styling with subtle black letters reversed out of a stylized sidewall. Firehawk Wide Oval tires are W-speed rated in 60-, 55-, 50-, 45-, 40- & 35-series sizes for 16-, 17-, 18- & 20-inch wheel diameters.